For the majority of games this season, only both sides of the stadium will be open. Away fans are normally housed in the North End of the Main (West) Stand, where the facilities and view of the playing action are good. For those games where the away side has a large travelling support then the North Stand will be allocated where up to 2,000 fans can be accommodated. The closest pub is the 208 Bar which is on Crieff Road about 300 yards away from the ground. The bar is popular with both home and away supporters. Follow the A9 towards Perth and then on reaching Perth continue on the A9 towards Inverness. You will see the ground on your right and at the next roundabout you need to turn back on yourself and then take the slip road to the ground. The ground is well signposted around the local area. For a map showing the location of the ground click here (to take you to the Street Map website). There is a good sized car park (�2) at the ground, which can be quite time consuming at the end of the match to get out of. Perth train station is nearly three miles away from the ground, which is really too far to walk. Best bet is to grab a taxi. 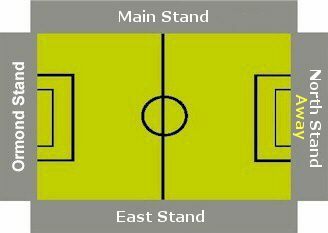 For home supporters there are 10 wheelchair spaces available in the Main Stand plus another 10 in the East Stand. Away fans in wheelchairs are accommodated in the south end of the West Stand, which is not located near to where the able bodied away supporters are housed. Places should be booked with the Club in advance of the game. Disabled supporters are admitted at a cost of �10, whilst the carer is admitted free. Dundee United, Dundee & Falkirk. 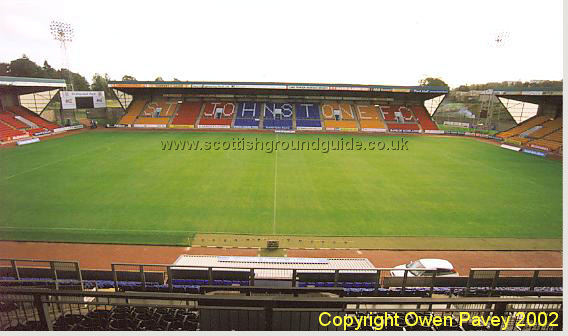 For the St Johnstone fixture list click here (to take you to the BBC Sports Website). 10,721 v Rangers, February 26th 1990. If you require hotel accommodation in the area then first try a hotel booking service provided by Football Hotels who are powered by Activehotels, who specialise in locating accommodation near or within a short travelling distance of the football ground. They also have the added advantage over some other hotel booking services that you pay on departure. Yes this site will earn a small commission if you book through them, but it will go to help with the running costs of keeping the Guide going. To access their Perth page click here.